Letter from Geo[rge] G. Mackenzie to [Robert Underwood] Johnson, 1891 Feb 4.
element that will prevent or extinguish fires, drive away trespassers, and otherwise by an insensible magic preserve order in the reservation. It is even suggested that the troopers might take an occasional scout through the Park; but I am astonished that so much of a concession is granted by those who believe in the wonderful influence of a shoulder-trap and a sabre. An occasional “scout” however, by the troopers and their lieutenants would, to anybody who knows the mountains, be simply a source of merriment. The trouble is that the proposal to run the Park by means of a military camp is made by those who have not the first syllable of knowledge of mountaineering, and the special conditions of the Yosemite reservation. 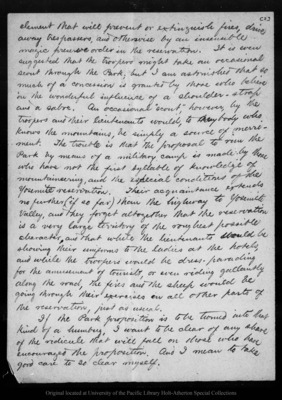 Their acquaintance extends no further (if so far) than the highway to Yosemite Valley, and they forget altogether that the reservation is a very large territory of the roughest possible character, and that while the lieutenants would be showing their uniforms to the ladies at the hotels, and while the troopers would be dress-parading for the amusement of tourists, or even riding gallantly along the road, the fires and the sheep would be going through their exercises in all other parts of the reservation, just as usual. If the Park proposition is to be t[illegible]ed into that kind of a humbug, I want to be clear of any share of the ridicule that will fall on those who have encouraged the proposition. And I mean to take good care to so clear myself. Original letter dimensions: 28.5 x 20.5 cm.